©2016 Jorge Diaz-Amador. Text, images and other content on this site are original copyrighted works, except where noted. CinemaTechnic and Jorge Diaz-Amador own exclusive rights to this content under the United States Copyright Act of 1976. Unauthorized use and/or duplication of this material without express and written permission from this website’s author and owner is strictly prohibited. ARRI began developing the concept of the 35BL in 1966. At the time there was no hand-holdable, silent, reflex camera available for 35mm cinematography. ARRI filled this need with a camera that changed cinematography forever. Panavision soon followed with the silent hand-holdable Panaflex, and the dominant age of the Mitchell BNCR was at an end. The ARRI 35BL series was one of ARRI’s longest running film cameras, in production from 1972 until 1990. Over 1000 35BL cameras were made. The 35BL was one of the most common A-Camera silent studio cameras, used on motion picture sets until the early 1990’s when the ARRI 535B and Moviecam Compact became popular. It’s use then gradually diminished as newer cameras such as the ARRICAM became available. The BL was introduced in October 1972, just in time for the Olympics in ARRI’s home town of Munich. It was used extensively to document the Olympics. This first version of the camera, later called the BL-I was very unique in that it was the first silent, reflex, dual-pin registered hand held camera and- it was capable of high speed photography up to 100fps! It was a truly revolutionary camera. It was very successful for a 35mm silent camera; more than 1700 were sold. These original BL-I’s had the drawback of having to employ a blimphousing around the lens to prevent movment noise from being transmitted out the lens mount and through the lens. ARRI offered a prime lens blimp that worked with the older ARRI Standard mount lenses, and another to fit the Zeiss Super Speed primes (Mk. I T1.4 series). There were also blimps for certain zoom lenses, notably the Angenieux 25-250mm T3.9 and 20-120mm zooms. These cameras had a bayonet lens mount, 180º fixed butterfly shutter, dual pin registration and four pull-down claws (necessary for 100fps top speed). The BL-I had an analog tachometer and footage counter (odometer style). These cameras have a bridge plug, similar to the one on the ARRI 35-III but not compatible with it. A special cable was needed to supply extra voltage for shooting speeds above 50fps. The BL-I’s circuit boards cannot be easily removed for emergency field service. The BL-I model ran up to No. 35326. Introduced in 1975 (along with the 16SR). High speed capability is abandoned. A dual-claw pull down was introduced, as is more typical of silent studio cameras. This reduced the camera’s noise level. The camera’s top speed is limited to 50fps. A new motor with much higher torque was introduced. The camera has a new digital tachometer and footage counter. Circuit boards are slotted and can be replaced in the field. A new, acoustically isolated PL mount is introduced. There is no need to use lens blimps. The PL mount greatly simplifies the adjustment of the camera’s flange focal depth. With the Bayonet mount, the camera had to be disassembled to make this critical adjustment. A new 180º “half moon shutter” replaces the bowtie mirror of the earlier cameras. Mirror clearance is reduced and certain older lenses will not clear the shutter. Later models introduced a variable shutter with 180º, 172.8º, 144º and 135º settings. This shutter was used in all subsequent BL models. The main body and electronics housing castings are changed. The electronics housing is noticeably larger. Top speed of 50fps is maintained. The magazines have a 1mm displacement of the position where the film enters the body of the camera. BL-III mags can be used on the earlier cameras, but BL-I and BL-II mags cannot be used with the BL-III. A new eyepiece, shared with the 35-3 offer an improvement in viewfinder image. New viewfinder is much larger, with a bigger exit pupil that makes it much brighter than the earlier finders. New finder extension without a prisim is much brighter. Introduces Arriglow, which illuminates the markings on the ground glass to allow easier framing of dark scenes. Top speed is reduced to 40fps. Sound level is reduced to 22dBA. Many BL-III’s were converted at the ARRI factory into BL-IV’s, with the installation of the new viewfinder and Arriglow electronics. Introduced 1988. Discontinued with the introduction of the 535A in 1990. Completely new film movement block with a much quieter compensating 7-link design. Adjustable pitch allows the camera to be fine-tuned for lowest noise level. Sound level rated at 20dBA. 3-perf movement available. Introduces a new footage counter/ tachometer. A separate battery for counter memory is no longer needed. BL-4s magazines have an external timing adjustment. Timing on older BL magazines requires disassembly. These mags also allow the loop size to be adjusted, eliminating the necessity of re-looping the mag in the changing tent if a loop is off size. The Evolution terminology refers to the upgrades that P+S Technik, a German company started by former ARRI Munich engineers, have developed for the 35BL. The main component of the Evolution program is a completely new viewfinder that resembles the ARRI 535 unit. The Evolution viewfinder allows the eyepiece to be swung to the left or right sides of the camera, as is common on most truly modern 35mm cameras (ARRI 435, 535 and Moviecam Compact). Illuminated format markings are now projected into the image, which allows the use of different format masks with a single ground glass. This is useful because it allows the combination of different formats without needing a separate ground glass for each combination. The Evolution program also includes a completely new, compensating link film movement similar to the 35BL-4s, and including pitch control. The movement is available in 3-perf as well as 4-perf formats. It is now possible to upgrade a BL-3 to beyond the BL-4s specification with P+S Technik’s upgrades. Recently P+S introduced a new motor and electronics package that further evolves the 35BL. The P+S Technik 35BL Evolution upgrade is no longer offered. 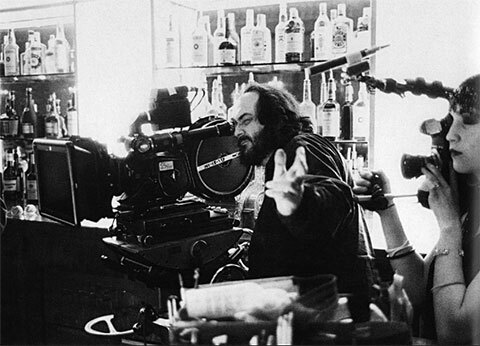 Stanley Kubrick with his Arriflex 35BL-II with 1000′ mag, Finder Extension, Video Assist and ARRI 6.6 x 6.6 Matte Box on the set of The Shining. The 35BL-III was introduced after production of The Shining so it was not used on that film. On the right edge of frame is Vivian Kubrick shooting Making The Shining on an Aaton LTR with Zeiss High Speed 16mm format prime lens.